I totally used to be. Or, at least, I tried really hard to be. If your house is anything like mine there is a LOT happening. It’s so easy to drop the ball and not be prepared or forget an event entirely. My Type A personality used to not understand how this happened to people. “I” was ready. Insert four kids, a homeschool schedule, sports schedules, and a blogging calendar. Now I’m more likely to be the one apologizing for being late, not showing, or showing up at the wrong place with the wrong kid. It happens more than I care to admit. Sigh. See the faint grid lines in the background? And how each page is divided up into different spaces for your different lists and ideas? Those elements are inspired by the bullet journal. The bullet journal was invented by Ryder Carroll. You can learn more about his system and the philosophy behind it here. I won’t go into all the details of a true bullet journal here because you don’t need to know them to enjoy these pages. I will say that a bullet journal uses bullet point lists, short, concise language, and can include anything you’d like to plan for or remember in the future. The bullet journal is adorable and you to try this kind of quick and dirty creativity in your life. Here’s why! 1.) It’s quick. I don’t have time to commit to anything that takes more than a few minutes a day. 2.) It’s pretty. Taking a few minutes and jotting down life helps me to see the good and appreciate it. 3.) It’s a nice way to record memories of the season without commiting to a scrapbook. 4.) It’s a creative outlet for me in a month so busy I really need a creative break! How to use this holiday planner…. 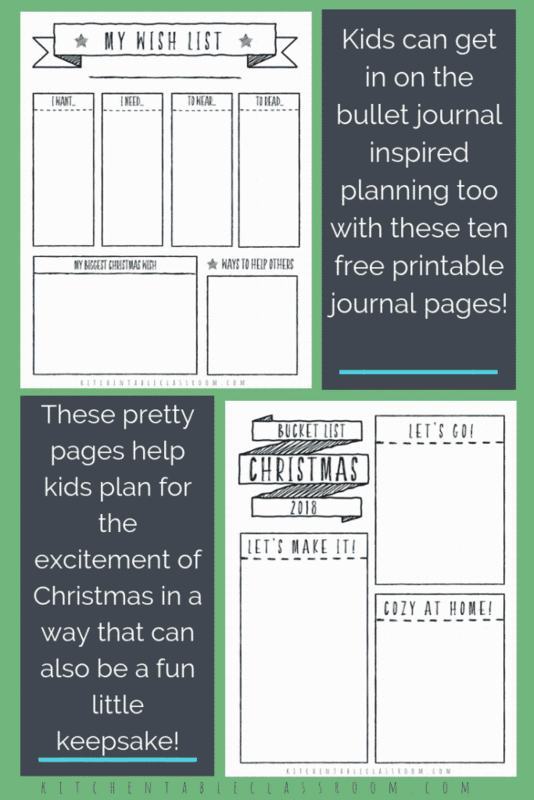 Because my focus here at the Kitchen Table Classroom is generally kids I designed these Christmas journal to be used by kids and moms together. 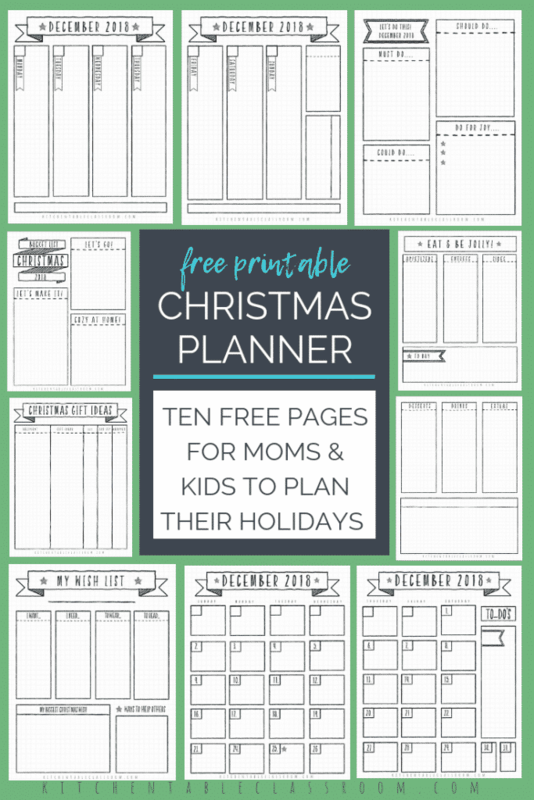 Some are more suited to the mamas in the group and some to the kiddos but I think anyone can have some fun with these holiday planning pages. 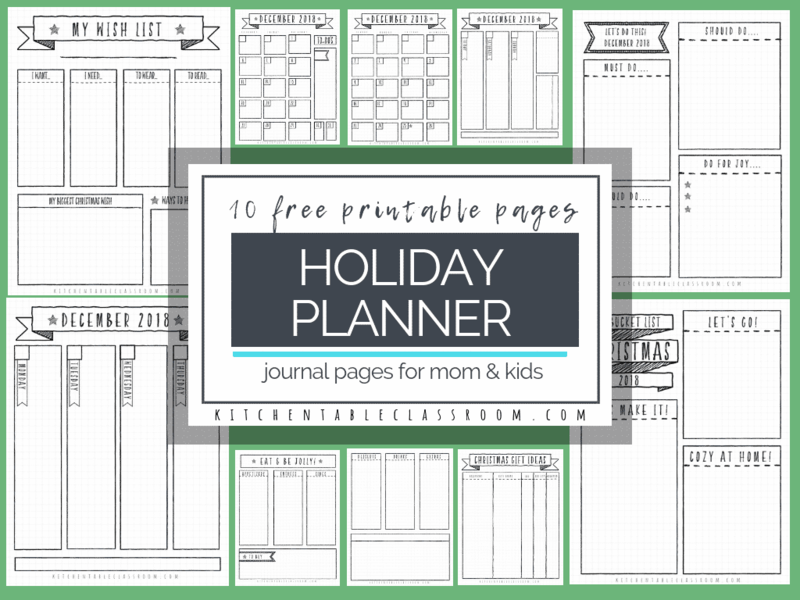 The fun and creative part of these holiday planner pages is that they have a few prompts and grids to organize your thoughts but other than there is no limit to how you use them. All you really need for a bullet journal is a pen. These black ones are my favorite. But you can include anything you’d like. Do you enjoy using watercolor paints? Include them! My personal favorite are these watercolor markers. The colors are super vibrant and they are an easy way to add a splash of color! I worked on some of these pages with my daughter last week and she kept asking “Can I add this? What about this? Am I allowed to include this?” All the yeses! Add it all. 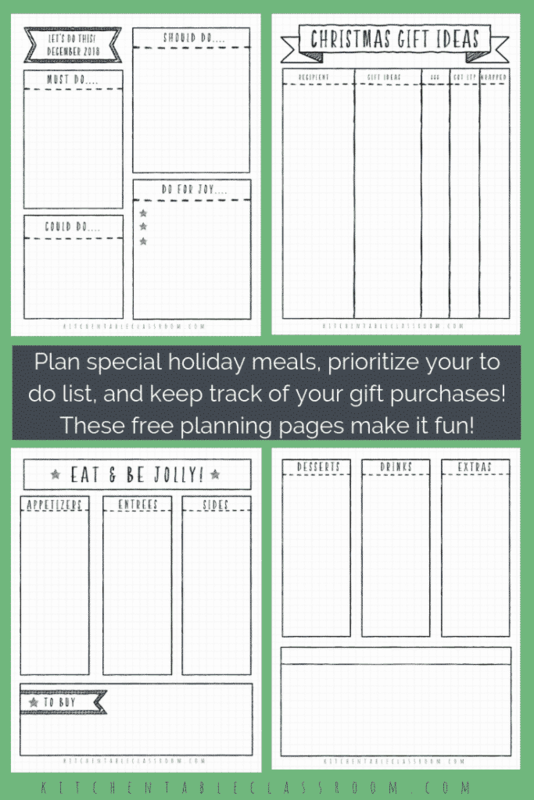 These holiday planner pages are meant to be a record of what you’ve done, a plan for what needs done, and a place to dream a bit! 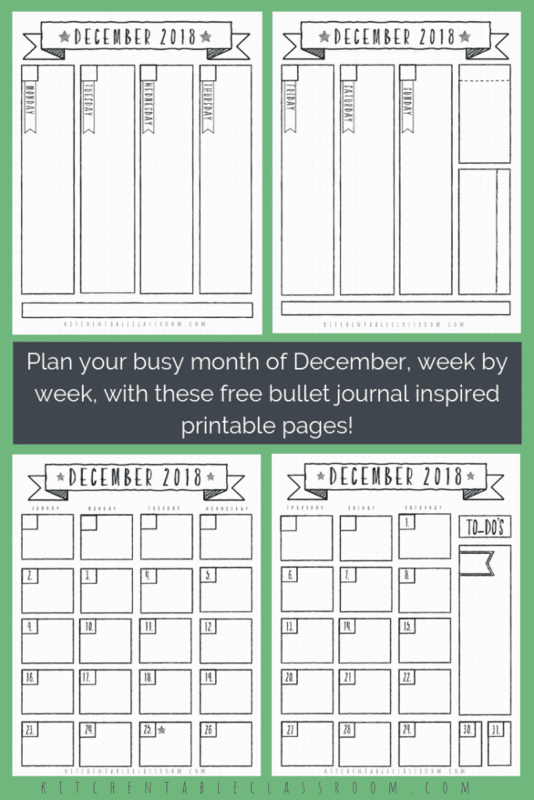 If you’d like to get these ten free Christmas bullet journal pages in easy to print PDF form just use the subscribe form below to become a Kitchen Table classroom subscriber. Then go check your email for a “confirm to subscribe” email from me. Upon confirming your subscription you’ll receive a subscribers only password that will give you instant access to alllll the free printables in my Free Resource Library. Just click on the thumbnail and the PDF will pop right up for you! You’ll be the first to know about my newest free printables and fun projects in my weekly email. Are you already a Kitchen Table Classroom subscriber…. If you’re already a subscriber with me there’s no reason to subscribe again. Just go to my Resource Library and enter that subscriber password and download away. If you don’t have it check the bottom of every newsletter I send. There will always be a link my Resource Library as well as the password. If you loved this holiday planner I hope you’ll share it on your favorite social media channel!